According to the newly release epidemiological report stroke is the first leading cause of death in China and fifth in the United States [1,2]. It is also the leading cause of acquired disability [1,2]. About 800,000 people experience a new or recurrent stroke each year and one dies of a stroke every 4 minutes on average in the United States [2,3]. With increased lifespan and a worldwide rise in diabetes and obesity, a drastic increase in the societal burden of stroke is inevitable . Diabetes is a well-established risk factor for ischemic stroke. Diabetes significantly exacerbates ischemic brain damage by accelerating the damage maturation latency, recruiting ischemic resistant structures such as hippocampal CA3 and dentate gyrus, thalamus and cingulated cortex into damage, transforming an ischemic infarct into a hemorrhagic one, and inducing post-ischemic seizures . Yet, there has been no neuroprotective drug in clinic proven to be efficacious in ameliorating diabetes-enhanced ischemic brain damage. Intensive insulin therapy with tight control of blood glucose level has not yield a beneficial outcome in three clinical trials including ACCORD, ADVANCE and VADT [6-8]. Investigating the relation between diabetes mellitus and cerebral stroke may guide us to find a better clinical management strategy down the road. Though many drugs have been shown to be neuroprotective in various experimental stroke models, virtually none of them have been approved to be efficacious in clinical trials . Recently, attention has been drawn to the macrolide antibiotic drug rapamycin, an inhibitor of mammalian target of rapamycin (mTOR). The mTOR, a typical Serine/Thronine protein kinase, is under the regulation of PI3K/Akt, Ras-MAPK, and AMPK signaling pathways. Once activated, mTOR induces phosphorylations of its downstream proteins including P70S6K, S6 and elF4E . Normally, mTOR functions as a sensor of extracellular signals including stimulations from energy levels and stress. It regulates angiogenesis, cell growth, apoptosis and autophagy, and other metabolic processes . Alteration of mTOR signaling is associated with cancer, cardiac diseases, neurological diseases, diabetes, and certain inflammatory diseases . For example, excessive activation of mTOR causes neurodegenerative diseases and inhibition of mTOR by rapamycin ameliorates the neuronal damage in mouse model of Alzheimer's Disease . Further, inhibition of mTOR also offers neuronal protection in models of Parkinson's disease (PD) and epilepsy [14-16]. We and others have demonstrated that under euglycemic condition, inhibition of mTOR by rapamycin significantly reduced brain damage in rats subjected to a transient forebrain ischemia and reperfusion . Recent studies have also shown that inhibition of mTOR signaling ameliorates pathological progression of diabetic nephropathy and diabetic cardiomyopathy [18,19]. However, there has been no report to demonstrate whether inhibition of mTOR is detrimental or beneficial to the outcomes of cerebral ischemia and reperfusion damage in diabetic animals. The objectives of this study are to examine whether diabetes activates or inhibits mTOR and whether inhibition of mTOR signaling by rapamycin reduces diabetes-enhanced ischemic brain damage. Pathogen free male Wistar rats (weighing 250-300 g) were purchased from vendor (Charles River) and kept in a controlled environment (12:12 h light/dark cycle, 50-70% humidity, 24°C) and provided with free access to water and food. All experiments were conducted in accordance with the Guide for the Care and Use of Laboratory Animals (NIH Publication No. 80-23, Revised 1996) and approved by the Institutional Animal Care and Use Committee (IACUC) at the North Carolina Central University. All efforts were made to reduce the number of animal use and to minimize animal suffering. Forty-two rats were divided into 6 groups with 6-8 rats in each subgroup: Non-diabetic sham control (NG); Non-diabetic ischemia and reperfusion (NIR); Vehicle-treated Diabetic Sham Control (DC+V); Vehicle-treated diabetic ischemia and reperfusion (DIR+V); Rapamycin-treated diabetic sham control (DC+R); and rapamycin-treated diabetic ischemia and reperfusion (DIR+R). Rapamycin (LC Laboratories, USA) was initially dissolved in 100% ethanol to make a stock solution of 20 mg/ml, which was stored in -20°C. Immediately before injection, the stock solution was diluted in 5% Tween 80 and 5% polyethyleneglycol 400 to final concentrations of 4% ethanol and 1 mg/ml rapamycin . Rapamycin (1 mg/kg) was injected intraperetoneally once a day for one month prior to the induction of cerebral ischemia. The formalin-fixed brains were dehydrated, embedded in paraffin, and sectioned coronally at 5 μm thickness. The sections were stained with hematoxylin and eosin (HE) and the histological outcomes were evaluated under a light microscope at 400x magnification. Bright red-stained acidophilic neurons with shrunken, triangular dense purple nuclei were considered as dead neurons. The numbers of dead neurons in the cortex were counted from a minimum of four non-repeated microscopic fields located on the frontal-parietal cortex and presented as percent of cell death. TUNEL staining was performed according to the manufacturer's instructions (The DeadEnd Fluorometric TUNEL system, Promega Corporation, USA). In brief, the sections were deparaffinized and rehydrated. Proteinase K solution was added and incubated for 8 min at room temperature. Equilibration buffer (100 µl) was added and equilibrated at room temperature for 5-10 minutes. TdT reaction mix (50 µl) was added to the sections and incubated for 60 minutes at 37°C in a humidified chamber. Slides were immersed in 2X SSC for 15 minutes, washed and mounted with Vectashield mounting medium containing PI. The results were viewed under a confocal fluorescence microscope (Nikon Eclipse E600 FN, USA) and TUNEL positive neurons were labeled in green. The brain tissues collected from the cortices were homogenized and subcellular fractions were separated through a series of centrifugation . Protein concentration was measured using BCA method according to the instruction provided by the manufacturer (Millipore). An equal amount of (25 μg) protein of the cytolic fraction was loaded in each lane and separated by electrophoresis on 10%-12% SDS-polyacryl-amide gels (Introvgen), transferred to the PVDF membranes (Millipore, USA), and blocked with blocking buffer (Li-COR Biosciences, Lincoln, NE, USA) at room temperature for 1h. The membranes were incubated overnight at 4ºC with specific primary antibodies against phospho-P70S6K (1:1000 Cell Signaling Technology USA), phospho-S6, phospho-AMPK (1:500, Cell Signaling Technology USA), LC3I/II (1:1000, Abcam, USA), phospho-ERK1/2 (1:1000, Cell Signaling Technology USA), and Ras (1:1000, Abcam USA). The membranes were washed and incubated for 1h at room temperature with the anti-rabbit secondary antibody (1:10000 Odyssey USA). Immunodetection was performed using Odyssey Infrared Imaging System (Li-COR). Densitometry scanning of the bands was carried out using IRDye 800 (Li-COR Biosciences, Lincoln, NE, USA) and the ratio of the target band density to internal loading control beta-actin were calculated and presented as relative density. Data were analyzed using the SPSS 13.0 statistical software package. The statistical significance of was determined with one-way analysis of variance (ANOVA) and followed by LSD post-hoc test. All data are expressed as the mean ± standard deviation (SD). A value of P<0.05 was considered statistically significant. In addition to confirming hyperglycemic status after 3 and 7 days of STZ injection, blood glucose levels were also measured prior to the induction of cerebral ischemia. Figure 1 presents the mean blood glucose levels in each group. As expected, the average blood glucose contents were 26.5 mM in diabetic animals and 5 mM in non-diabetics (p<0.01). There was no difference between the vehicle and rapamycin treated rats. Preischemic blood glucose levels in the rats. Blood glucose levels were significantly elevated in diabetic groups compared with non-diabetics. Data are mean ± SD, ## p < 0.01 vs. non-diabetic groups. The histopathological outcome in the cortex was evaluated at 16h after reperfusion. There was no observed damage in any brain regions in the non-diabetic sham-operated rats. A few scattered dead neurons were observed in the cortex of the diabetic sham-operated rats. The number of dead neurons was significantly increased after 16h of ischemic/reperfusion in both non-diabetic and diabetic rats. About 12% of the cortical neurons were dead in non-diabetic animals and the percent increased to 36% in diabetic animals (p<0.01). Compared with vehicle-treated diabetic rats, rapamycin treatment dramatically reduced the damage in the cortex in the diabetic rats subjected to ischemia and reperfusion (Figure 2). The protective effects of rapamycin were also observed in the hippocampus. Diabetic ischemia caused close to 100% neuronal death in the CA1 and about 60% in the CA3 and dentate gyrus subregions. Rapamycin treatment reduced the CA1 damage to 50%, CA3 damage to 30% and almost completely spared the dentate gyrus (data not shown). Histopathological outcomes in normoglycemic (NG), vehicle treated-diabetic (DM+V) and rapamycin-treated diabetic rats subjected to 10 min cerebral ischemia. A, Photomicrographs of the cortex; and B, summarized neuronal death in the cortex. HE staining. Arrows indicate dead neurons and arrowheads denote the survival neurons. Bar = 50 μm. Data are mean ± SD, **p <0.01 vs. sham-operated group and ## p < 0.01 vs. diabetic 16h I/R. Double-labeling of TUNEL and propidium iodide in the cerebral cortex after 16 h of reperfusion. A, TUNEL positive cells were labeled in green and cell nuclei were labeled in red. Necrotic cells are shown as condensed nuclear staining indicated by arrows in red channel. Most TUNEL positively stained cells are not PI positive, suggesting high specificity of TUNEL kit in detecting apoptotic cell death in this experiment. B, Bar graph shows the number of TUNEL positive cells. ## p < 0.01 vs. diabetic rats (Figure 3). TUNEL staining is a standard immunofluoroscent method for detecting DNA fragmentation. We used a commercial available TUNEL kit to detect DNA fragmentation. The brain sections were stained according the manufacturer's instruction and counter stained with PI. The results showed that transient cerebral ischemia induced a few scattered TUNEL positively stained cells in the cortex at 16 h after ischemia and reperfusion in non-diabetic animals (Figure 3, Upper panel). Diabetes caused significant increase in TUNEL positive cells after ischemia and reperfusion compared with non-diabetic ischemic animals (Figure 3, middle panel). 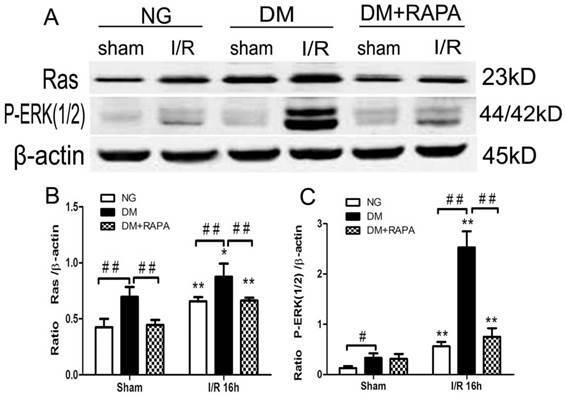 Treatment with rapamycin drastically reduced the DNA fragmentation in the diabetic animals subjected to ischemia and reperfusion (Figure 3, lower panel). It is noticeable that not all TUNEL positive neurons were PI positive, suggesting a relative specificity of the TUNEL kit we have used to detect aopototic cell death. Phosphorylation of P70S6K has been used widely as a marker of mTOR activation. As shown in Figure 4, cerebral ischemia in non-diabetic animals did not cause activation of mTOR after 16 h of reperfusion in the cortex. In contrast, diabetes significantly increased the phosphorylation of P70S6K both prior to and after cerebral ischemia and reperfusion. Treatment with rapamycin completely prevented the diabetes-induced mTOR activation (Figure 4). Changes in the levels of p-AMPKα and LC-3II after cerebral ischemic/reperfusion was evaluated by the Western blot. The p-AMPKα increased moderately in non-diabetic animals after ischemia and reperfusion compared with sham-operated control (p<0.01). Diabetes significantly reduced the levels of p-AMPKα at both baseline level and after ischemia and reperfusion comparing to non-diabetic counterparts (p<0.01), albeit an elevation of p-AMPKα after reperfusion in diabetic rats. Rapamycin increased the post-ischemic p-AMPKα comparing to diabetic ischemic rats, but did not reach to the level observed in sham-operated non-diabetic rats (Figure 5A,B). Ischemia and reperfusion caused a pronounce elevation of LC3-II in both non-diabetic and diabetic rats; however, the levels in diabetic rats were significantly lower than those of non-diabetic sham and ischemia/reperfusion groups. Rapamycin did not alter the LC3-II contents in diabetic animals (Figure 5 C,D). MAPK is both an upstream of and downstream of mTOR. ERK1/2 has been shown to be phosphorylated after ischemia in diabetic rats [20,25]. In this study, Ras-ERK1/2 pathway was monitored using specific antibodies using the ischemic cortical tissues. 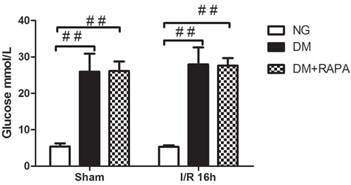 The results showed that cerebral ischemia increased both Ras and p-ERK1/2 at 16 h of reperfusion in non-diabetic rats. Comparing to non-diabetic rats, diabetes resulted in a much pronounced increased in Ras and p-ERK1/2. 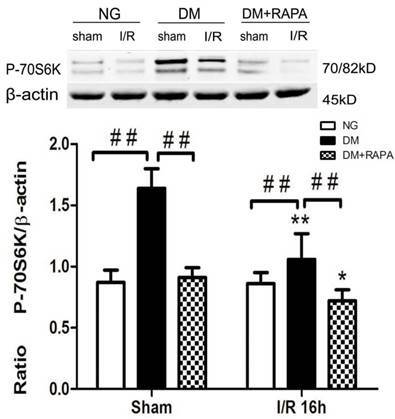 Rapamycin intervention blocked the increases of both proteins in diabetic animals after ischemia and reperfusion (Figure 6). The levels of p-P70S6K in control and ischemic animals at 16 h of reperfusion in the cortex. Upper panel, representative Western blots showing protein levels of p-P70S6K in the cortex; and Lower panel, Bar graphs showing the relative band density of p-P70S6K. *p <0.05, **p <0.01 vs. each sham-operated group and ## p < 0.01 vs. diabetic rats. The protein levels of p-AMPK and LC3-II in the cortex at 16h after reperfusion. A and C, Representative Western blots for p-AMPKα and LC-3II; and B and D, relative optical band density of p-AMPKα and LC-3II. **p <0.01 vs. each sham-operated group and ## p < 0.01 vs. non-diabetic rats. Diabetes activated and rapamycin inhibited the Ras-ERK1/2 pathway. A, Western blots showing representative bands of Ras and p-ERK1/2; B and C, Bar graphs summarize average relative densitometry of Ras and ERK1/2, respectively. **p <0.01 vs. sham-operated group and ## p < 0.01 vs. diabetic rats. Both basic and clinical studies have shown that preischemic hyperglycemia exacerbates neuronal damage induced by cerebral ischemia . In this study, we induced a transient cerebral ischemia in STZ-induced 2 month diabetic rats treated with mTOR inhibitor rapamycin or vehicle. The pathological outcome revealed that after only 16 h of reperfusion following a 10 min forebrain ischemia, the neuronal death, both necrotic and apoptotic, were significantly enhanced by diabetes, comparing to normoglycemic ischemic animals. Such increased damage was associated with activation of mTOR signaling pathway, phosporylation Ras-ERK1/2, and suppression of AMPKα. Rapamycin treatment markedly reduced ischemic brain damage in the cortex and hippocampus of the diabetic rats and its protective effect was linked to deactivation of mTOR and Ras-ERK1/2 pathways. The mTOR gene was first described in yeast as the pharmacological targets of the microbicide rapamycin , and subsequently described in other invertebrate and vertebrate organisms. The mTOR contains two functionally distinct complexes, mTORC1 and mTORC2, which play central roles in translation initiation, transcription, cytoskeleton organization, cell growth, and proliferation as well as cell survival [27,28]. Though alterations of mTOR activity have been identified in several neurological diseases , the role of mTOR activation in cerebral ischemia remains controversial. In one hand, middle cerebral artery occlusion decreased the phosphorylation of mTOR and its downstream proteins and enhancement of mTOR phosphorylation using ferulic acid ameliorated ischemic brain damage [30, 31]. Further, decrease of phospho-P70S6K has been shown to increase neuronal cell death after cerebral focal ischemia and that ischemic postconditioning activates the mTOR [32,33]. On the other hand, activation of mTOR through inhibition of the mTOR upstream regulator PTEN increased cerebral infarction [32,33]. In a parallel study conducted in normoglycemic rats, we have observed that mTOR pathway was transiently activated after 3 h of reperfusion following forebrain ischemia and returned back to baseline level after 16 h and 7 days of reperfusion. Inhibition of mTOR using rapamycin suppressed the activation of mTOR pathway and significantly reduced ischemic brain damage in both the cortex and hippocampus . The role of mTOR in mediating diabetes related complications has not been well documented. One report indicated that type-2 diabetes increased phosphorlation of mTOR myocardium of the mice and rapamycin, as well as metformine, were capable of preventing diabetes-induced cardiac malfunction through inhibiting mTOR signaling [19,34]. Activation of mTOR may also play an important role in the development of diabetic nephropathy because increased mTOR activity was observed in podocytes of the glomeruli and inhibition of mTOR prevented podocyte injury and hindered the progression of diabetic nephropathy [35,36]. Up-to-date there has been no report to document the change of mTOR in diabetic ischemic animals. Our results showed that p-P70S6K increased significantly in both diabetic sham-operated controls and ischemic rats and that rapmycin drastically inhibited the phosporylation of P70S6K caused by diabetes. These data suggest that diabetes predispose the brain tissues to be vulnerable to ischemic injury by activating the mTOR signaling and that inhibiting the activity of the mTOR is capable of reducing diabetes-exacerbated ischemic brain damage. We pre-treated the ischemic rats with rapmaycin based on the consideration that diabetic animals develop neuronal death and post-ischemic seizures after only 3 h of reperfusion. This approach limits the clinical relevance of the study. Autophagy is an intracellular catabolic process that responsible for recycling of degenerated proteins and subcellular organelles . Autophagy could be activated by fasting, glucose depravation, exercise and other stresses. AMPK, which is known to suppress mTOR, is a major inducer of autophagy [38,39]. Rapamycin also activates autophagy by suppressing mTOR . Basal level autophagy plays a house-keeping role to maintain cellular homeostasis that is important for cell survival . Inhibition of this process leads to accumulation of denatured proteins in cells and causes diseases such as Alzheimer's disease, Parkinson's disease, and Huntington's disease [42,43]. However, over activation of autophagy may also cause cell to die . Therefore, autophagy is often described as Type II programmed cell death (PCD), to distinguish it from apoptosis, the Type I PCD . Activation of autophagy after cerebral ischemia has been reported for many years [46,47]. However, it remains unclear whether activation of autophagy is beneficial or detrimental to the ischemic tissue. While several studies reported a protective effect of autophagy in experimental stroke [48,49], others observed opposite outcomes when autophagy is activated [50,51]. In the present study we observed increased levels of p-AMPKα and LC3-II to LC3-I ratio, a marker for autophagy, in non-diabetic animals after ischemia and reperfusion of 16 h in the cortex. This finding is consistent with the reports in literature . The activation of p-AMPKα and autophagy is probably caused by reduced energy level during ischemic period due glucose depravation. In diabetic sham-operated rats, however, the p-AMPKα level was significantly lower than that of the non-diabetic rats, suggesting that high glucose status suppresses AMPK signaling. This is consistent with previous reports showing that hyperglycemia suppresses autophagy [53,54]. Though diabetes per se suppressed the p-AMPKα, ischemia still induced an elevation of p-AMPKα. Correspondingly, LC3-II was activated after ischemia in diabetic animals, suggesting ischemia is capable of activating autophagy even under diabetic condition. Interestingly, rapamycin treatment did not alter diabetes-induced changes in p-AMPKα and LC3-II. Although it is likely that the protective effects of rapamycin is not associated with autophagy based on LC3-II protein blot, we could not draw a conclusion regarding to the role of autophagy in mediating diabetes-enhanced ischemic brain damage and rapamycin protection because other biomarkers and indicators of autophagy were not measured in current study. ERK1/2 plays a key role in cell proliferation and growth. Cerebral ischemia is known to increase the phosphorylation of ERK1/2. However, it is not known whether such an increase represents an defensive response or actually mediates cell . Inhibition of ERK1/2 by PD98059 increased and activation of ERK1/2 decreased ischemic brain damage both in vitro and in vivo [56,57]. Whereas, emerging evidence suggested that the activation of ERK1/2 may be associated with neuronal death and the inhibition of MEK/ERK pathway can provide neuroprotection , especially in diabetic ischemia. Here, we found that Ras and phosphorylated ERK1/2 were increased in the cerebral cortex after ischemic injury, which is consistent to our previous reports . Diabetes further enhanced the Ras and p-ERk1/2 protein levels after ischemia comparing to non-diabetic ischemic animals. Treatment with rapamycin significantly prevented the diabetes-induced elevations of Ras and P-ERK1/2, suggesting that suppression of p-ERK1/2 is associated with neuroprotection. These findings are consistent with previous reports showing that ERK1/2 is highly expressed in diabetes-recruited damage brain structures and inhibition of ERK1/2 pathway reduces ischemic brain damage in hyperglycemic animals [20,59,60]. It is not known how rapamycin suppresses Ras-ERK1/2 pathway since it is generally believed that Ras-ERK1/2 is an upstream pathway of mTOR expression. One possibility is that ERK1/2 is both an upstream regulator and a downstream target of mTOR. Another possibility is that increased reactive oxygen species (ROS) activated the ERK1/2 signaling. It has been well documented that hyperglycemia increases ROS production after ischemia . ROS is capable of activating multiple signal transduction pathways, including the phosphorylation cascades leading to the activation of mitogen-activated protein kinases (MAPKs) [62,63]. We speculate that hyperglycemia induced ROS production activated ERK1/2 and rapamycin prevented the ERK1/2 activation through inhibition of ROS production. Indeed, rapamycin has been shown to protect the mitochondria against oxidative stress in rat model of Parkinson's disease , to improve endothelial function , to strengthen vascular contractility , and to prevent diabetic myocardia  by reducing oxidative stress. In summary, our results have demonstrated that diabetes enhances ischemic brain damage and activates mTOR and Ras-ERK1/2 signaling pathways after transient cerebral ischemia and reperfusion. Inhibition of mTOR with rapamycin significantly reduces ischemic brain damage and the protective effect is associated with suppression of Ras-ERK1/2 pathways, without affecting plasma glucose levels and autophagy. This study is supported by American Epileptic Society to PAL, National Natural Science Foundation of China (81560226) and Natural Science Foundation of Ningxia Hui Autonomous (NZ14281) to XY, Chinese National Science Foundation 973-Preproject (2014CB560711) to JN. The Biomanufacturing Research Institute and Technology Enterprise (BRITE) is partially funded by the Golden Leaf Foundation. The funders had no role in study design, data collection and analysis, decision to publish, or preparation of the manuscript. The authors thank Mr. Brent Caligan for proofreading. PL, PAL, JN, ST conceived and designed the experiments. PL, XY, CH, YM performed the experiments. PL, XY, CH, PAL analyzed the data. PAL, JN, TS contributed reagents, materials, and analysis tools. PL, PAL wrote the manuscript.